Our April Education seminar was a fascinating look at some of the largest deals in the Downtown area as Atlanta invests $6.4 Billion of revitalization and rediscovery projects in our urban core. AJ Robinson, the President of Central Atlanta Progress (CAP) moderated the panel and presented a detailed overview of some of the most prominent developments rising up through Downtown Atlanta. These are major, large scale projects, including the Gulch and Underground, and it takes great insight and discernment from these pioneering developers to undertake this long term transformation. Matt Smith, Senior Vice President of Development with MAA shared the story of the $100 million, 438 unit apartment complex Post Centennial apartment project across two mid-rise towers. This is a major investment in the downtown housing market, with 44 apartments designated as affordable housing. This represents a ten year investment, and MAA also has another seven acre site that will developed as a mixed use project downtown. Jake Nawrocki, President of Newport US RE, spoke about his company’s assemblage of 52 buildings within 8 city blocks and nearly 13 acres in South Downtown Atlanta. The first phase of construction will commence this Fall starting along Mitchell Street and will be source o9f urban revitalization for years to come. Currently, local Atlanta retail pop-up shops line the corridor formerly known as “Hotel Row”, demonstrating the vitality and innovation thi8s project will bring to Downtown. As the third panel member, Scott Taylor, President and CEO of Carter, sees the Downtown area being the next frontier, largely due to the visionary efforts of AJ Robinson and CAP. He presented the Summerhill Atlanta project as a part of the redevelopment of Turner Field. This 83-acre mixed-use development will encompass multi-family, retail, student housing, office and townhome development, and will emphasise a highly walkable, creative and energetic community. 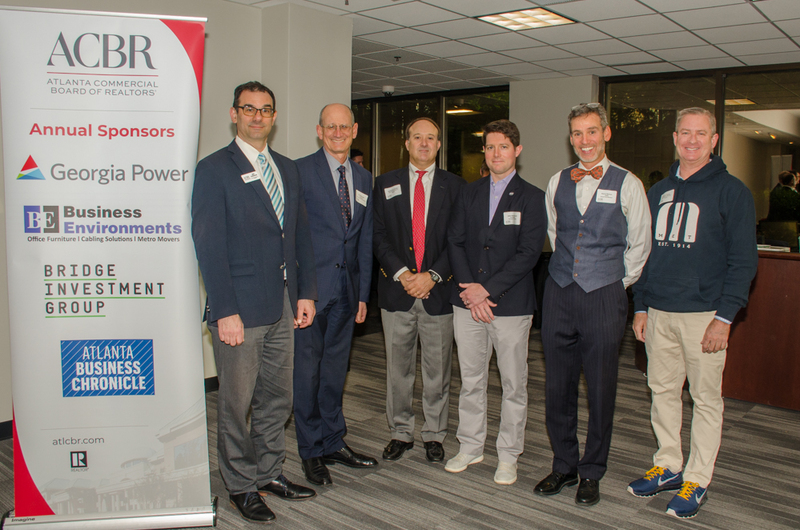 All four of our speakers this morning are true industry powerhouses in Atlanta, and the ACBR would like to thank the terrific efforts of both Steve Barton, with CBRE, and John Winter, with Cushman & Wakefield, for putting together this tremendous panel.